Scunthorpe United 1-2 Newcastle AET‎ – Move. Run. Sports. But before the moment of magic from Sammy, it was a very good old-fashioned cup tie . . . but quite a few of the players must take a long hard look at their performances from the game. The one’s that come straight to mind for me have to be Leon Best, Demba Ba, Peter Lovenkrands and Dan Gosling. All looked very out of their depth and struggled from start to finish (or they were subbed off). Leon Best looked like he was doing his best not to score a goal, hitting the ball everywhere but on target. Possibly one of the worst players I have ever seen play in a black and white shirt. He really is such a poor excuse of a striker! Demba Ba has not had a very good start to his Newcastle career in the two games he has played, subbed at half time against Arsenal and subbed again last night. Dan Gosling is probably the only player I hold much hope for, because of how long he was out with injury it is going to take him a while to get back to match fitness, but surely the amount of times he gave the ball away should not be happening so much. Looking to see him improve in the next game he plays! Who would believe that Ryan Taylor over the wall would happen for the second game running?!?! He really is starting to build up a cult following at this rate, which is such a change for the man who often ended up as a scapegoat . . . myself included in that. But I am more than willing to give him a second chance after his solid performance against Arsenal. 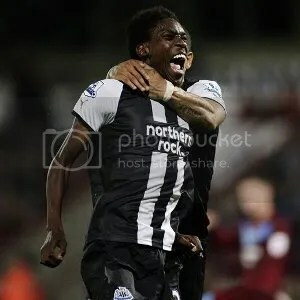 Sammy Ameobi and Haris Vuckic, two players who have come through the academy with ages of 19 and 18 were very impressive when they came off the bench. They must be pushing close to playing their first premiership games for the club. Looked very good on the ball and made things happen, which cannot be said for all of the team. A very important win after being a goal down and on the back foot for more of the game than we would have liked. At times we were kept in the game by Tim Krul in a man of the match performance. The save he made after the ball took a deflection off Colo’s back was amazing and he really had no right to be able to get to the ball. It was not pretty at times, but with the aid of extra time we got the win in the end and are through to the third round of the league cup.